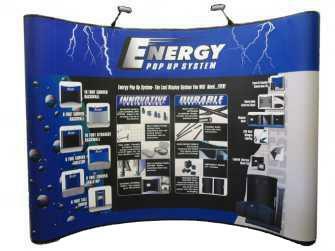 Pop up displays are the most popular type of graphical signage at trade show booths. 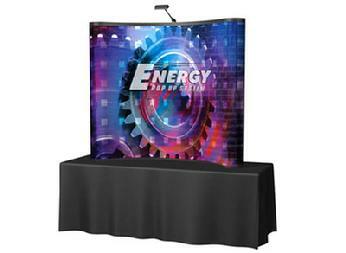 Lightweight, portable, and easy to set up, our pop up booths and tabletop displays convey your message and product loud and clear. Professional trade show designers can help you put together a complete package, unifying your presentation and maximizing your use of convention space. From large 8' curved pop up displays to simple tabletop displays, with graphical customization or tower lighting, our displays are sure to capture attention from the competition. This is the strongest pop-up system on the market today. Heavy Duty construction makes this the perfect choice for frequent travel and heavy use. 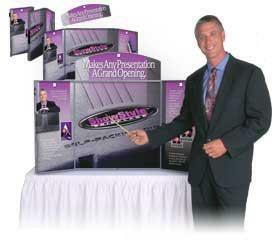 This convenient sized trade show booth is portable and effortless to setup. Comes complete with halogen light and deluxe hard case. The frame utilizes 1/2" round extruded aluminum tubing to provide maximum stability and strength, while remaining extremely lightweight. Displays come with velcro-compatible fabric (for maximum flexibility), or we can create full graphic displays using your design. Fabric or graphic panels attach easily with magnetic strips to give a seamless professional look. This system is expandable and comes with a variety of accessories. Ships UPS or as airline baggage.